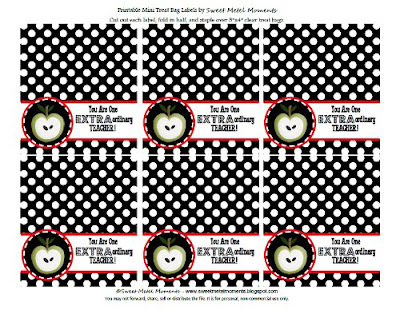 Sweet Metel Moments: Free Printable - Teacher Appreciation Gift - "Extraordinary Teacher"
Free Printable - Teacher Appreciation Gift - "Extraordinary Teacher"
Teacher Appreciation Week is coming up! For those of you who have multiple children or have a lot of teachers to thank, I wanted to come up with a gift option that was affordable and practical. Who doesn't like gum? I know I always like to have some in my purse. So I created a mini treat bag label that says "You Are One EXTRAordinary Teacher!" to attach to a little treat bag full of Extra gum. Once the labels are printed, cut them out and if you want, there is a small space for your child to write his/her name on them. Fill the treat bags with Extra gum, fold the labels in half and staple them onto the bags. I hope your teachers enjoy their sweet treat! You're welcome, Candi! So glad you can use these treat bag labels! And thanks so much for visiting my blog! Your packaging makes even the simplest gift special! Thanks! I used quite a few of your ideas for my kids' daycare/preschool teachers. I'm sure they will love them. I'm a music teacher and very rarely get gifts, so I wanted something small and cheap enough to include everyone. These are perfect! Love this idea, and your printable is adorable! I am a teacher and I would LOVE to give this to my parent volunteers! Could you PLEASE change the wording for me? Teacher to Volunteer? Thanks! So glad you are able to use the printable Jaime! Thank you so much for visiting my blog! Where did you get those treat bags? Thanks! Hi there! I got the bags from Michaels, you can also get them at Joann or any craft store. Thank you so much for visiting my blog! I used these for our "specials" teachers; health, PE, music, art and library. They are so cute and not terribly expensive so it's great when you have 10 teachers that aren't the homeroom teacher. I used clear cello bags and folded and taped them on the back to make them the right size. I got the clear cellos and gum at Dollar Tree! Saved me a long trip to Micheal's. Thanks so much! Hi Krissy, thanks for the tip on the cello bags! I am so glad you were able to use these for your teachers! Thank you so much for visiting my blog and taking the time to leave a comment! Where did you find the smaller-sized packs of Extra Gum? Hi Janis, I found those packs at Dollar Tree. Thank you for visiting my blog! Do you still have this file available to maybe edit? My daughter has 6 aides and I wanted to make them something. I didn't know if you could possibly change the word teacher to aide? Hi there! Yes, I can create a custom file for you! I have an Etsy shop where I can make customized changes. Visit my shop here: https://www.etsy.com/shop/sweetmetelmoments?ref=hdr_shop_menu and leave me a convo if you are still interested. Thank you so much for visiting my blog! Thank you for visiting my blog Gloria! So happy you are able to use it! Have a blessed day!